Enamel is the tough, almost rocklike, outer layer of the teeth that protects the rest of the tooth from decay. Right below the enamel is the dentin. The dentin is a little softer than the enamel, so if bacteria gets to it, decay speeds up. Dentin has teeny tiny tubes (called dentinal tubes) that run through it. When the enamel wears through and the dentin is exposed to heat and cold, the tubes carry those sensations to the softer parts of the teeth, causing sensitivity. Underneath the dentin lies the cementum. Cementum is about the same hardness as bone tissue. It covers the surface of the root and serves as the anchor point for connecting the tooth to the bone. Periodontal ligaments attach to the cementum and the jawbone, anchoring the tooth in place and giving it stability. That being said, we’ll drop down into the root now. The pulp or nerve is in the center of the tooth and provides nutrition to the tooth. It is made of soft tissues that have nerve endings housed inside. 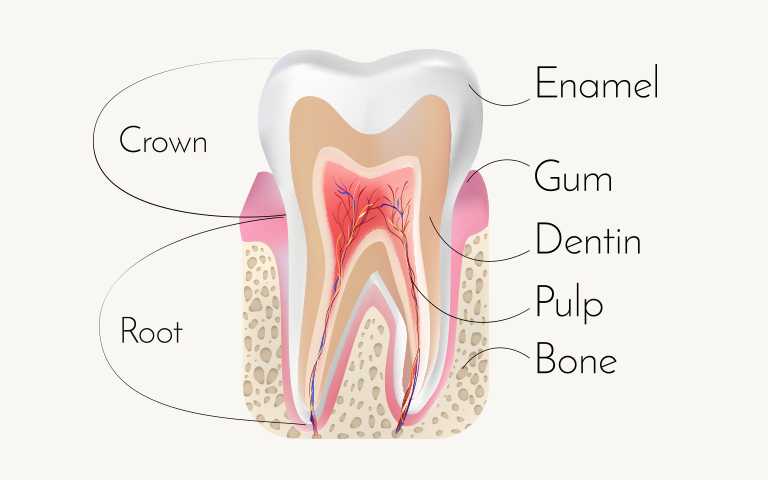 There are two kinds of pulp: coronal pulp, which sits under the cementum, and the radicular pulp, which is the part of the nerve that runs down through the root canal all the way to the bottom of the tooth where the periodontal ligaments anchor it to the bone. At the end of the root canal, radicular pulp basically merges into the periapical tissue which is full of blood vessels and nerves and runs between the tooth and the jaw, connecting with the periodontal ligaments along the way. The entire root of the tooth is covered by the gums (or gingiva), a soft tissue that surrounds the jawbone as well and provides protection for all the sensitive nerve endings housed in the root. When you get braces, the periodontal ligaments begin to adjust under the pressure applied by the wires and brackets. Cells called osteoblasts eat away at the jawbone on one side, while cells called osteoclasts build up your jawbone on the other side to accommodate and stabilize the shift. Over time, the teeth are able to settle into a new and healthier alignment!